In 2017, over 700,000 Rohingya people left Myanmar*, chased out by violence. The Rohingya ran to Bangladesh for safety. Now, they are crowded in camps, trying to prepare for the coming rainy season. For almost 200 years, the Rohingya have lived in Myanmar, but they have never been accepted. The Rohingya are Muslims – people whose religion is Islam. The religion of most people in Myanmar is Buddhist. The Rohingya’s background and language are also different. In 2017, the Myanmar people and army began to attack Rohingya villages. Whole villages were burned down in violent attacks. As many as 10,000 Rohingya people were killed. The Rohingya people became refugees – they left their homes to get away from the violence. Close to a million people have crossed into Bangladesh in all. Though Bangladesh took in the Rohingya refugees, it’s not happy about them staying there. But it’s not safe for the Rohingya to return to Myanmar. 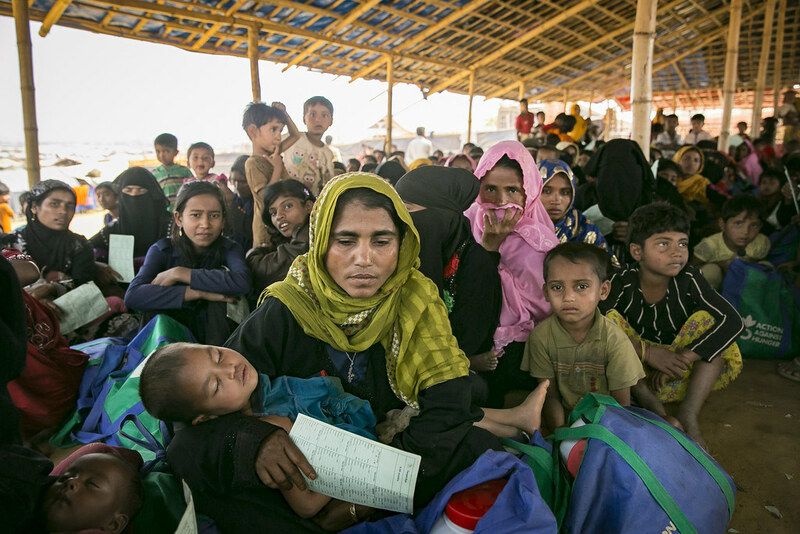 The Rohingya people became refugees – they left their homes to get away from the violence. Close to a million people have crossed into Bangladesh in all. 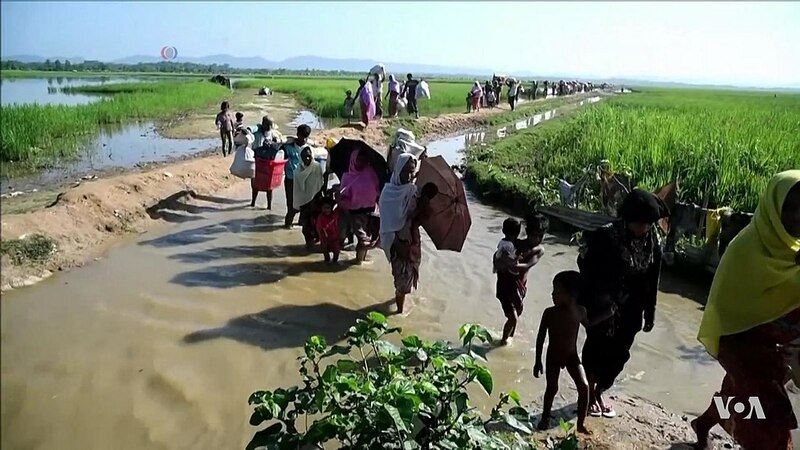 The picture shows the Rohingya walking to Bangladesh. 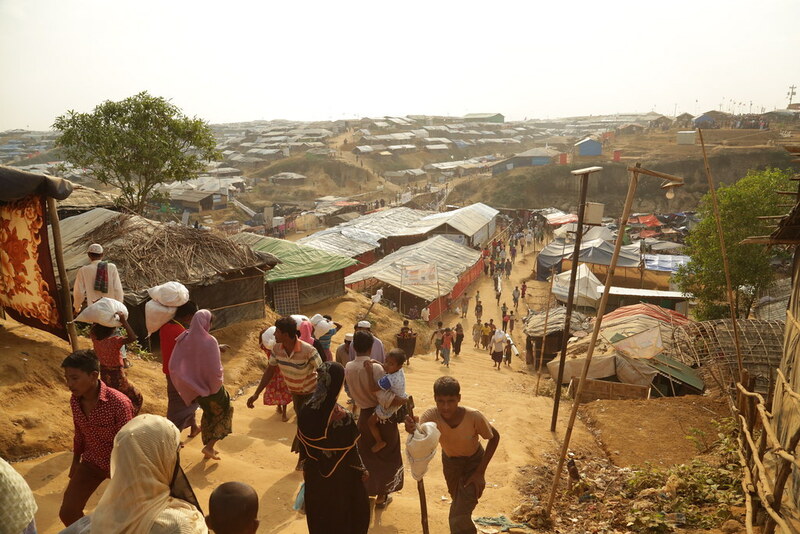 Many of the Rohingya are now part of Camp Kutupalong – the world’s largest refugee camp, with over 650,000 people. Having so many people packed into such a small area in poor conditions can be dangerous. It is hard to keep everyone fed and healthy. Many of the Rohingya are now part of Camp Kutupalong – the world’s largest refugee camp, with over 650,000 people. With so many people packed into such a small area, it can be hard to keep everyone fed and healthy. Because the Bangladesh government doesn’t want the refugees to think that they can stay forever, the Rohingya aren’t allowed to build “permanent” houses. So the refugees are living in huts made from bamboo and plastic. Though the refugees have been there for over a year and a half, the children can’t go to school. The Bangladesh government thinks allowing the children to go to school makes the situation seem permanent. 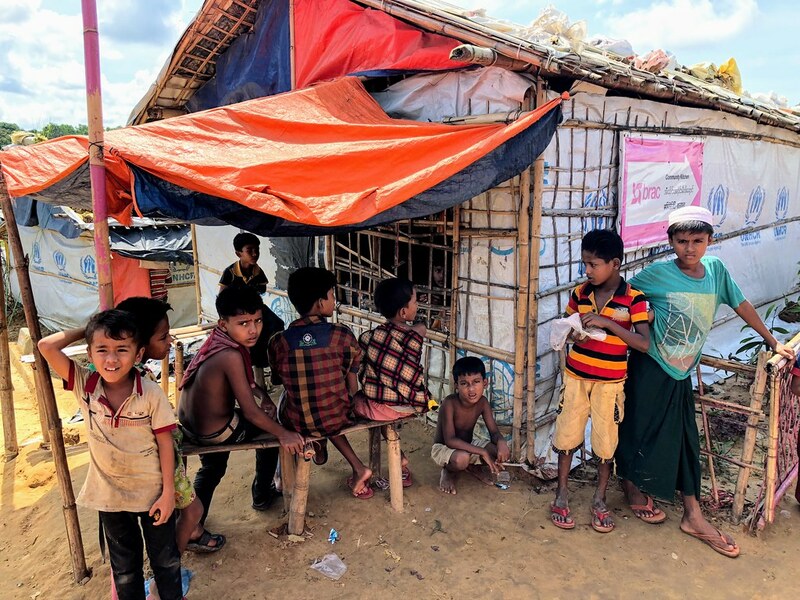 The Bangladesh government doesn’t want the refugees to think they are there for good, so the refugees are living in huts made from bamboo and plastic, and the children aren’t allowed to go to school. 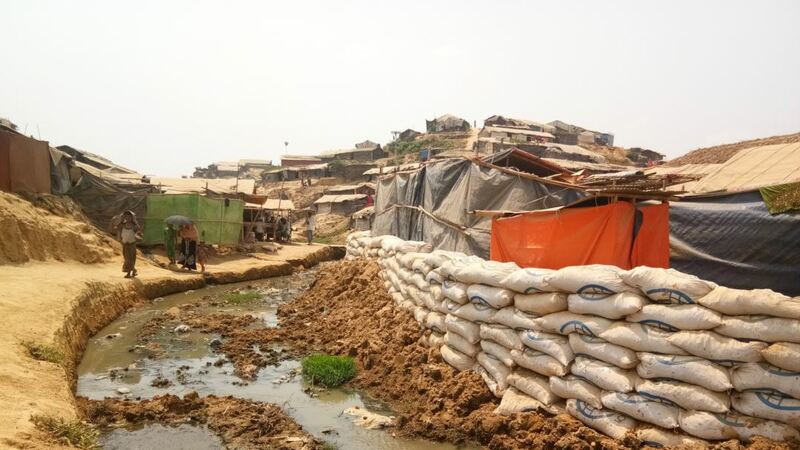 The refugee camp is in an area of Bangladesh that often has flooding problems during monsoon season. Monsoons are winds which bring long, heavy rains in from the ocean. They can last for months. The Rohingya, and groups helping them, are working to make sure that the camps are as safe as possible. They’re trying to support the ground so it won’t wash away. They are also digging drains and ditches to help deal with flood waters. The Bangladesh government has a plan for dealing with some of the refugees which has many people worried. 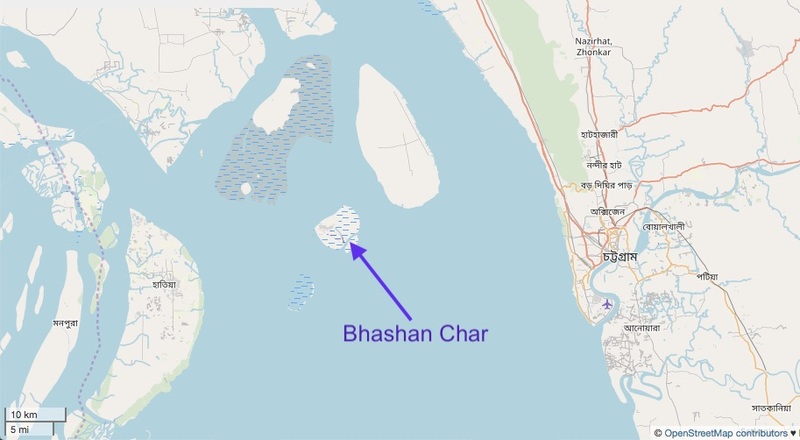 Bhashan Char is an island made of mud in the Bay of Bengal. It’s more than 18.5 miles (30 kilometers) away from the coast of Bangladesh. The government has been building a huge center there, planning to move many Rohingya refugees to the island. Bhashan Char is an island made of mud in the Bay of Bengal. It’s more than 18.5 miles (30 kilometers) away from the coast of Bangladesh. The government has been building a huge center there, planning to move many Rohingya refugees to the island. Bhashan Char is heavily affected by monsoons. Many people worry that if the Rohingya are forced to live on this island, there could be a disaster once the monsoons hit. The island could easily be flooded, and be so far away from land that it would be impossible to get help. For now, the Rohingya are stuck in a very difficult situation. They have lost their homes, and are living in a place where they’re not completely welcome. They are living their lives day to day without any real hope of a long-term solution to their problems. 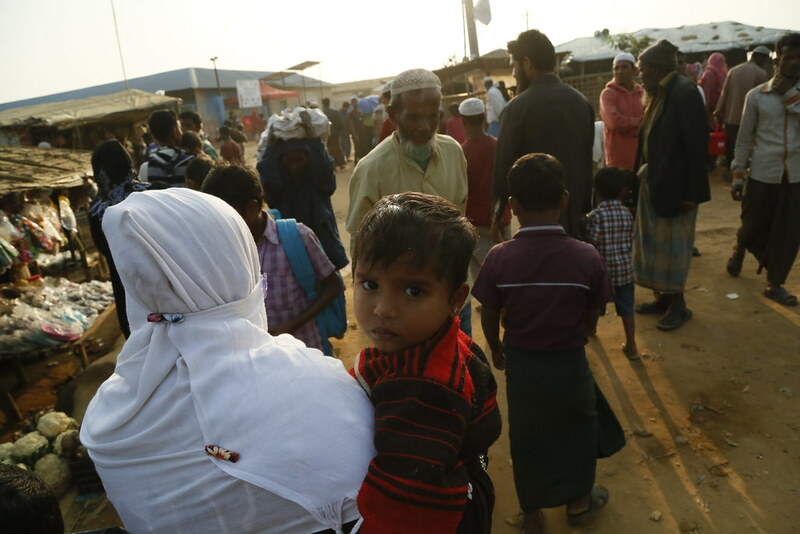 For now, the Rohingya are stuck in a very difficult situation. They are living their lives day to day without any real hope of a long-term solution to their problems. *Myanmar used to be called Burma.